The undertaker’s wife was a robust woman. In comparison both her sisters were slight. Lycoris Moir, the taller of the two, was tousled and bespectacled. She measured her customers for their mourning clothes with a faded linen tape measure, checking, double checking and checking again in the most meticulous fashion that she had the correct figures jotted in her notebook. The notebook was so full and tattered and ink-smudged that it looked as though it recorded the personal dimensions of all the bereaved of a millennium. ‘We are data-rich, my dears, data-rich,’ she would tell her sisters. Adrasteia was shorter, smaller; petite. Raven-haired and sleek, she had a disconcerting habit of studying her clients intensely, then tilting her head to one side as though she had made some silent, immutable judgement. She would raise her rusty tailoring scissors and snip snip the air in front of their faces, her black eyes glittering. No takers for my cardcut course this weekend sadly so no teaching for me. This means I can spend the weekend packing up books so that the builders can get to where they need to get. Lucky me. 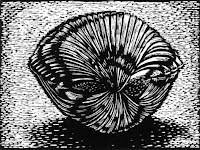 The cockle wood engraving is finished. What can I say? I don’t like it. It’s flat and uninteresting. Good practice though. Hope the etched version turns out better on Friday. Started putting some words down for my next series of prints. Having spent so long illustrating other people’s words, it was really satisfying to illustrate my own in creating the Red Scar series. That happened by accident really; the story (never finished) was written to amuse a friend and I hadn’t intended to use it as a starting point for a series of etchings… but that’s how it turned out. The image of the three characters in the coach was so vivid in my mind, I had to make a drawing of it. I don’t like my drawings. As a rule, they’re fairly dead on the page until I turn them into a print. I suppose it’s the combination of textures and quality of line and tone which is impossible to create in any other medium other than printmaking. This time, I’m going one step further; writing the story – The Undertaker’s Nuptials - specifically to generate images. We’ll see how it goes. 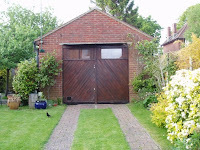 I realise this is off-topic but I had an interesting visitor this week; an archivist from the West Sussex Record Office. A few weeks ago, whilst clearing Dad’s workshop in Phase One of Project Atelier, I found some boxes of film from the 1920s and 30s. These were shot by my Great Uncle Harry Guermonprez, co-founder of the Bognor Regis Film Society. I feel strongly about local history and preserving our heritage, possibly because the city I live in was mutilated first by bombing in the second world war and then by poor town planning. What was once a thriving, modern port, rich in historic buildings, is now a featureless 21st century city, much like any other, with docks that are really beginning to feel the squeeze of the economic downturn. I’ve never been able to experience the old Southampton, except for the odd building or ruin which is all that’s left of the medieval city. I can appreciate the old photographs and films however, so I emailed Screen Archive South East which already has a few of the films made by the BRFS (see clips of them here: BRFS at Screen Archive South East). I was then contacted by Alan at the West Sussex Record Office who was quite excited by my news as he’s a bit of a fan of Uncle Harry’s apparently. He and a couple of colleagues have written a book about cinema in the region and had included a fairly comprehensive chapter on the BRFS (he brought me a copy – very interesting). Alan and the team at Brighton University will digitise the films so that they are available for people to view as important records of social history. They may also make a short film about how the two collections came to light. Bonus. I tried printing the block on my bookbinding press for the first time. Really didn’t think it would work but it’s great. A bit fiddly to get the block, paper and vinyl (used like an etching press blanket) under the platen as it only just fits but it actually produces a better print than I was pulling by burnishing. Bonus. 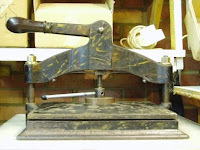 I’m including a picture of my bookbinding press in this post because it’s an unusual design. Bought it from good old ebay but the chap who sold it to me didn’t know anything about bookbinding or printing or this press. All the ones I’ve seen have either a T-shaped arrangement for screwing down the platen; this one has the screw underneath the arm bits (technical term there) and a lever for increasing the pressure once the platen’s been screwed down. I’d be interested to know if anyone else has seen one similar.